An attack on America from within is about to occur. The organization behind it is well financed and deeply entrenched in politics and business and they will stop at nothing to achieve their objectives. A three-phase plan is devised that could kill thousands. One homeless musician learns of the plan, but can he get anyone to pay attention before it’s too late? 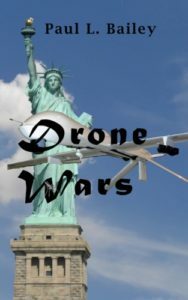 Read the first chapter of Drone Wars. Go to our store to see all of Paul Bailey’s books.